We all know it, any parent will tell you. Kids need to read and read voraciously. Shared reading is probably the single most thing that will improve their learning, both now and in the future. I’m guilty of cutting corners when I’m late with dinner and rushing to get them into bed. 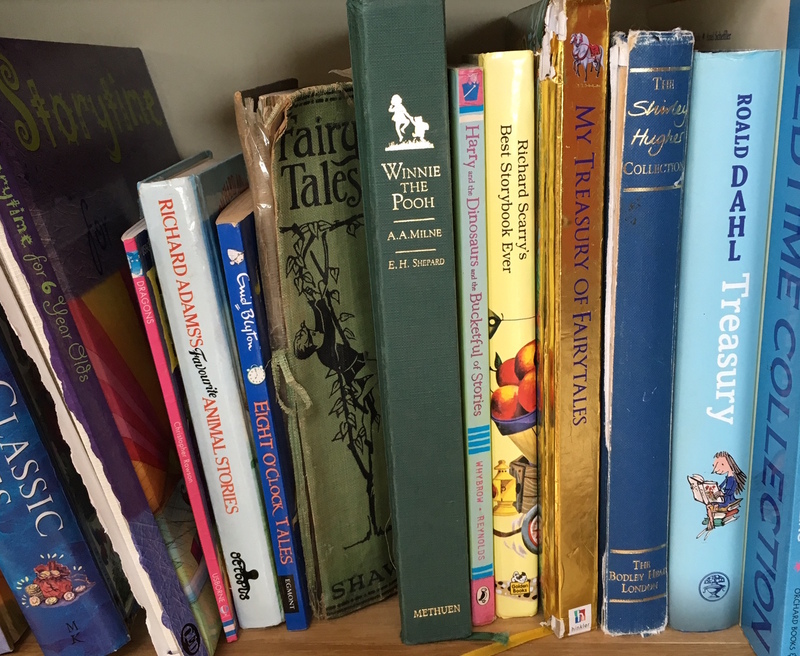 The winter seems a good time for more reading as a family – summer days stay light so long we end up doing other stuff – so I made a plan and tried to get a rhythm going this winter. We would be ready for bed and snuggle up in front of fire with cookies and milk and their choice of books. Reading has become something to love and look forward to . There is plenty of bargaining that goes on in our house. sometimes they are lazy and want to listen, after all it is nice to be read to. We also put aside time each week to go to library and ordered in advance the titles in a series I knew my daughter was into, so we could anticipate the next part of the story. Sometimes I think they should be more advanced in reading than they are, but realise it doesn’t matter if they still want loads of pictures, anything to build that love of reading and books. In all honesty, I realised that I still have a love of picture books. All the books I pour over are not fictional titles but geometric and natural reference books with plenty of illustrations to keep me going. she said one day when I’d obviously been banging on about it too much. That’s a fair comment as my fiction intake is low but I read plenty. It’s geometry books that I have a passion for at the moment. There are newspapers and magazines which in our house we have a stack of. My kids always say that their Dad is addicted to newspapers, we have a joke that every weekend we make a special trip to the news agents just to ‘feed Dad’s habit’ and buy at least 5 of the weekend papers. Okido started as an Arts and Science magazine for kids as young as 2. it has published several book titles also and has an engaging visual style and fun activities. Loop A fun newspaper for children with well advanced reading skills. Articles in an almost broadsheet format. Some great creative thinking here stimulating loads to think about. Stew. Is a recently new title and we have yet to explore it fully. I hear older primary children find it interesting and I’ve seen it in school classrooms. the Caterpillar An absolute beauty. Literature and poems for your children all packaged beautifully with wonderful original art. 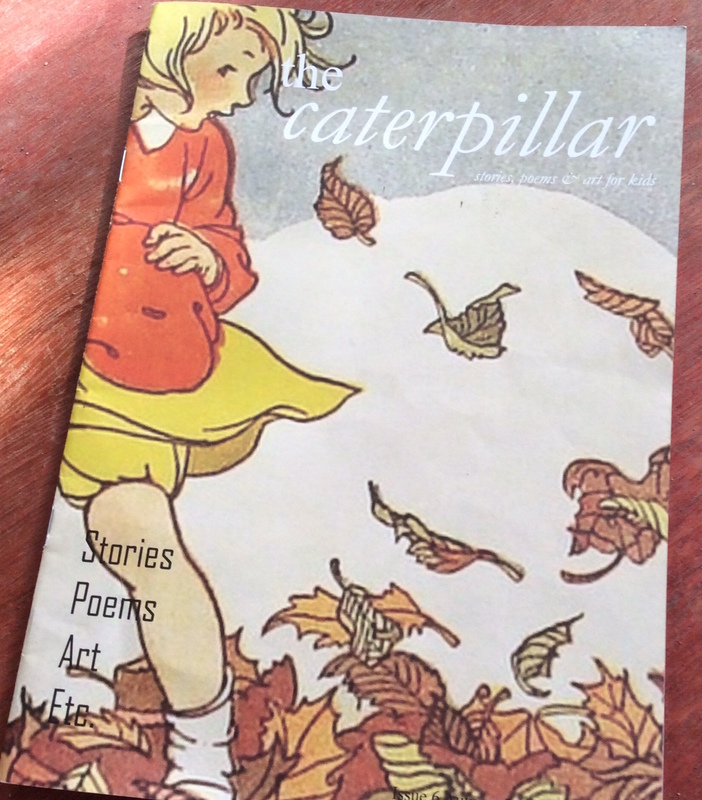 A sister publication to the adult version the Moth, Caterpillar magazine is quarterly and available online or in selected bookshops. Aquila has been around for years and rightly so. Aimed at the advanced reader it has fascinating articles on history, wildlife, arts and crafts and much more. Also has well populated reader feedback pages. Much loved and anticipated every month for its loyal subscribers. 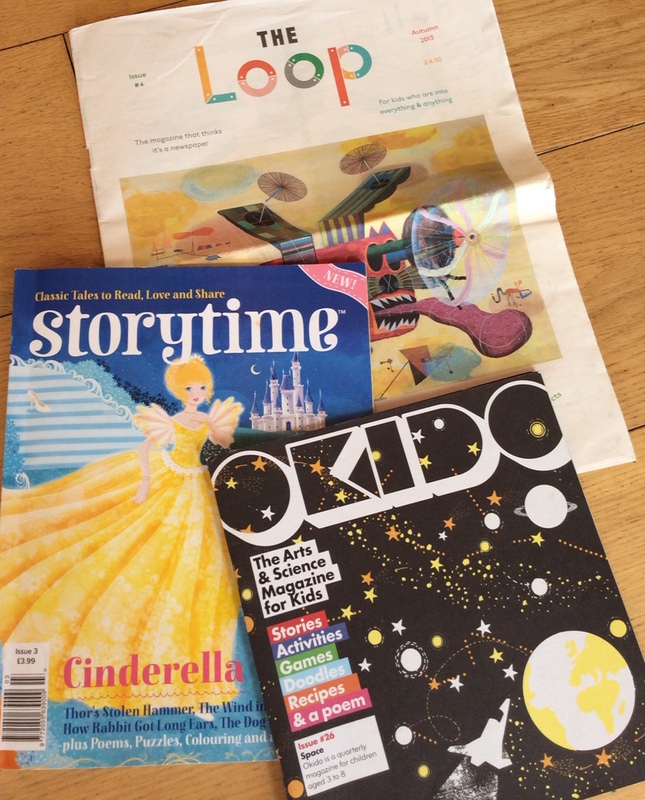 Storytime A publication launched a couple of years ago, which I was thrilled to find on a high street newsagent shelf. It shows that there is a mainstream interest for kids magazines not focussed on plastic stuff. Published monthly as an imprint from a large magazine publishers it features some well-loved stories and fairy tales. Anorak is another I came across, but I was slightly put off by the overwhelming advertising of fashion labels and expensive gadgets. Haven’t seen it recently but had some cartoon strip features. Amazing. A good base to start a deeper journey into the subjects that attract you. Subtitled ‘The most brilliant way to learn’ This magazine really is full. A double page spread on each subject, all based on the National Curriculum – if that is what floats your boat. The word searches and puzzles are always popular and each edition has a different theme. I can see it being popular in classrooms as its bitesize info would fit into spare minutes in the day. ‘The Colossal Book of Costumes‘ is full of colourful costumes from around the world and through the ages that we pour over time and again. ‘Look Again‘ is a sort of lift the flap peephole book using artworks from Metropolitan Museum of Art that when peeped at hold so many surprises. Always fun as we learn different things about the artworks each time we look, hence the title. As well as our shared reading I’m reading children’s fiction a bit at the moment as I’m reviewing several books that will be in the Smart Happy Project online magazine. 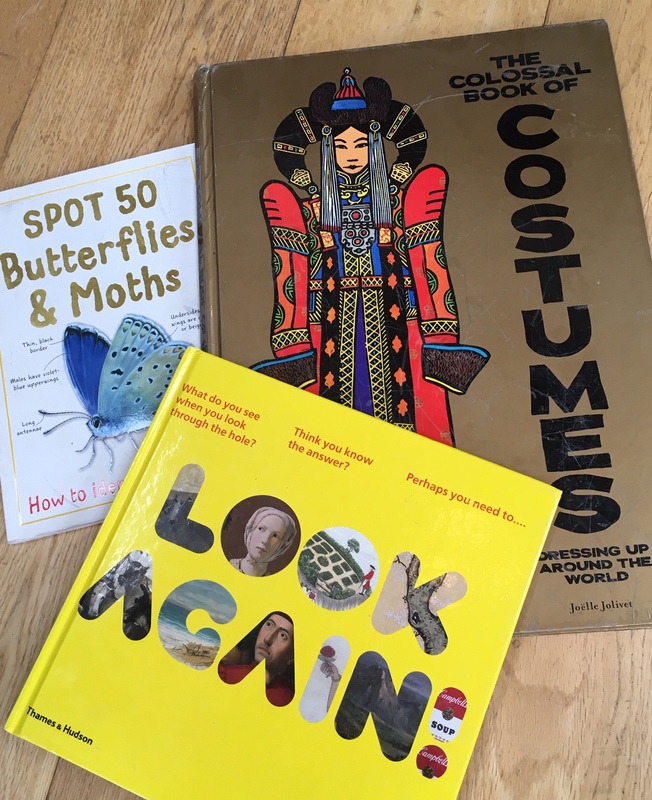 Read about a new title by MG Leonard ‘Beetle Boy’ or Den building in the classroom a resource book for creating inspiring spaces at home and in class. Whatever your preference, just share the joy of reading. it will last them a lifetime.